Former Fed chief Alan Greenspan recently delivered a mea culpa of sorts in the form of a 60-page Brookings Institute paper about the financial crisis. 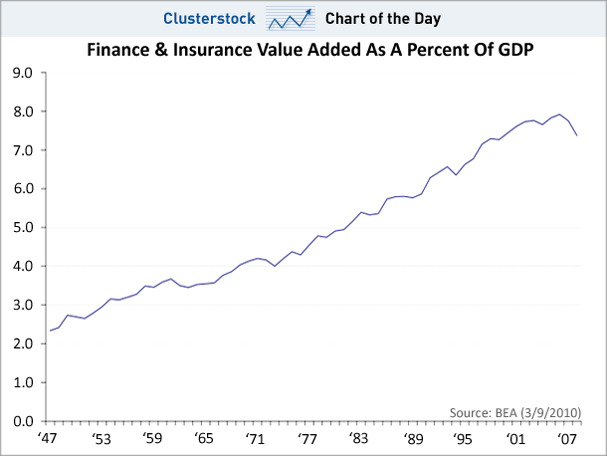 Among the charts he includes to explain the crisis is one that we’ve seen before, but never ceases to jar us. 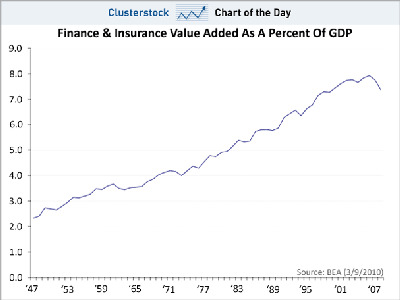 It’s the share of GDP* that come from finance and insurance, and though the number has begun to crest, we’re still WAY above any reasonable historical norm. The bottom line is that the financial bubble still has a lot of bursting left to do (though if Bernanke and Geithner have anything to say about it, it may take a while). *A note on the “value added” part: that measure simply refers to the industry’s contribution to GDP minus production that originated outside of the country. The distinction is obviously more meaningful when talking about vendors of physical products that are built outside our borders. You can get this dropped in your inbox every afternoon as The Chart Of The Day. It’s a simple. It’s convenient. It’s free. All we need is your email address, country and postal code. Sign up below!